Does your five-year-old watch in fascination as you work with Photoshop? 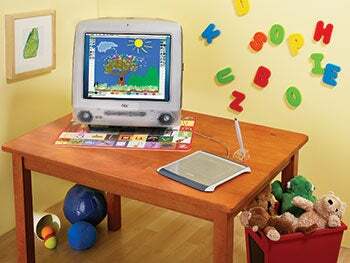 Encourage your child’s interests by turning your retired Mac into a digital art station. Small children often have trouble drawing with a mouse, so invest in a pen tablet such as Wacom’s Graphire4 4x5 ( ). You can get refurbished tablets for as low as $80 through the company’s online store. Use the Wacom Tablet preference pane to configure the device’s behavior (for example, you might want to disable the pen’s side button to prevent your child from accidentally pressing it). When it comes to drawing, check out the open-source painting program Tux Paint. The program’s art tools include a paintbrush, a Stamp tool, and a Magic tool that lets pint-size scribblers apply textures like grass and sparkles. For a more robust program, go with Software MacKiev’s Kid Pix Deluxe 3X, which includes a wide variety of stamps, a broader range of colors, and animation tools. To keep your little one from messing with your system files, create a new account with limited privileges. Go to the Accounts preference pane, and make sure that administrative access is not enabled. If you have OS X 10.3 or 10.4, you can limit access further. A Child’s Art: Station Tux Paint provides hours of entertainment for youngsters. Panther also includes a Simple Finder option—visit the Limitations tab when you create a user account and click on Simple Finder to configure it. When your child logs in, the programs you’ve enabled will appear in the My Applications folder in the Dock.